Background: Crisis as a topic in mental health is more relevant than ever. There are rapid changes happening in the world, involving politics, education, migration and so on. All these new events have consequences over mental health, at the short and long terms. Objective: Accomplish the need to understand the neuronal mechanisms underlying an illness after a crisis event, as well as a better guidance of the therapeutic intervention. Method: This article is a review of crisis and the consequent illness that it can originate. It consists of a brief presentation of the main contributions of several authors in their theoretical and practical components, from their starting point in the development of Crisis Theory. 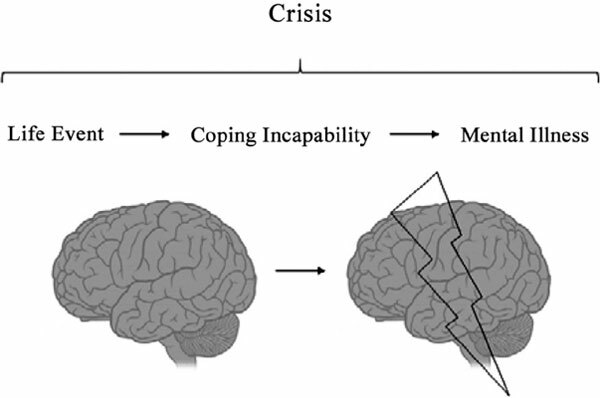 The review continues in a presentation of the correlations between the perpetuation of crisis and consequent mental illness, describing the known neurocircuitry underlying the anxious and depressive outcomes. The neurobiological connection between crisis and mental illness with psychotherapeutic intervention is discussed. Results: The present neuroscientific data allow the understanding of how the brain can work defining behavior, judgement or decision making. The knowledge of the neurobiology involved is increasingly relevant in this area, as it is in others that involve mental illness. Conclusion: As neuroscience progresses, neurobiology and neurocircuitry can provide the unifying language and the explanation to the processes involved in mental health and disease, permitting the use of psychotherapeutic techniques with more benefits to the patient. Crisis, psychotherapy, psychiatry, neurobiology, neurocircuitry, crisis intervention.